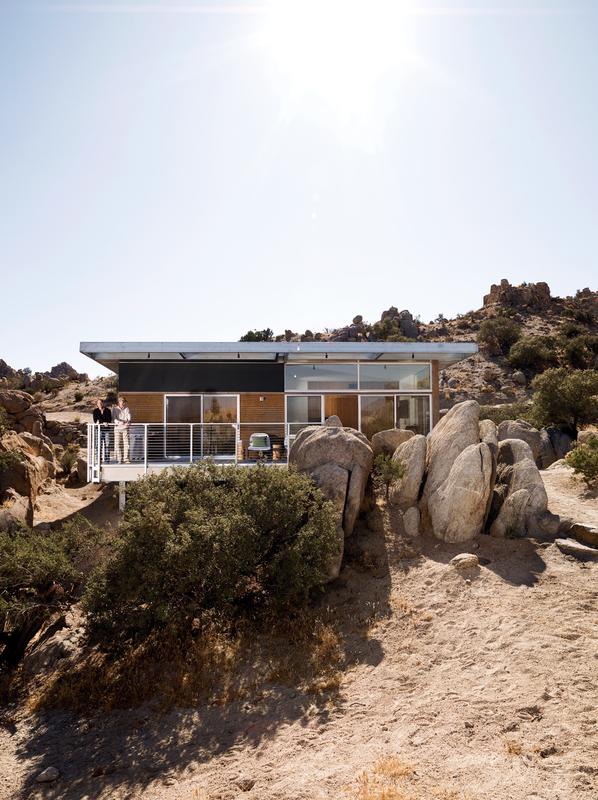 The Blue Sky prototype home tiptoes gracefully across the desert landscape just north of Joshua Tree National Park. Nestled amid piñon and juniper trees and outcroppings of boulders, the house’s six steel columns permit a seasonal stream to run underneath it. The clever steel frame allows the house to float above the wilderness—a concession to the lightness on the land that its owner, architects, and engineers so clearly wanted. Figuring out how to achieve this lightness, however, was anything but clear. When David McAdam, co-owner and chief dreamer of Blue Sky Homes, bought 2.5 acres of cactus-studded land near Palm Springs, California, he didn’t know what kind of getaway he wanted to build, but he did know one thing: no wood. “It’s boring, and I see how it works in the desert. It gets destroyed,” he says, remembering the damage he’d seen other houses suffer in the unrelenting sun. If the material isn’t handled perfectly, arid conditions turn it into a pretzel. So if not wood, then what? Nighttime hikes often end at the the “cowboy” hot tub where Smith soaks his feet: two nested Hastings galvanized livestock feeders. The tub is surrounded by a Veranda faux-wood deck and fed with hot water from the house’s solar hot-water system. The Blue Sky prototype house leads a second life as desert getaway for David McAdam and his partner Scott Smith. One large room houses the kitchen, dining, and living area; the backsplash and countertops are made by Vetrazzo. 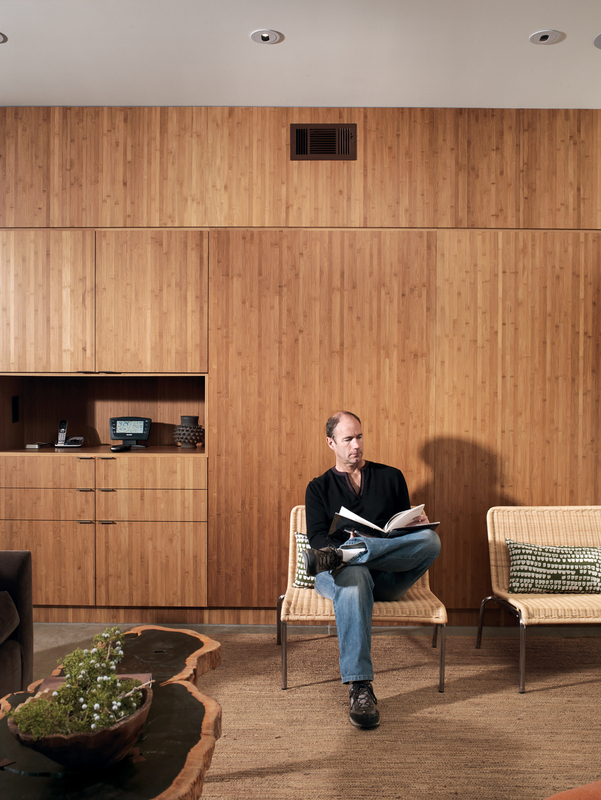 A Plyboo wall divides the interior of the house. The main living area extends to the deck through sliding glass doors. The orange David Chair and ottoman were designed by Palm Springs-based interior designer Christopher Kennedy and are from his eponymous line of furniture. Kennedy did the interior design for the whole house, playing a large role in choosing the decor and eco-friendly surfaces. The secret sauce for the Blue Sky Home is its framing system, which resists twisting and bending and won’t rust. 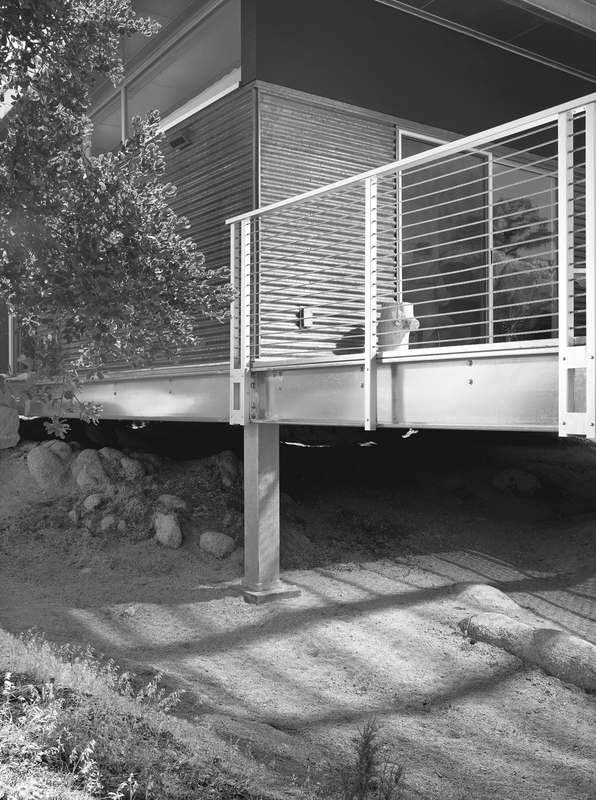 Eight carefully placed bolts in the joints in the steel frame absorb any movement, allowing the home to rest on small footings and meet California’s strict seismic standards. The carport stands apart from the home and is topped with Solar World’s Sun Module photovoltaic panels. McAdam and Smith have grown quite used to their small electric bills. As a paean to the old steel-mining shacks that inspired the home, McAdam sprayed the the corrugated-steel exterior with apple cider vinegar to create a warm rust effect. For all its hard environmental work, one of the most immediate of the Blue Sky Home’s pleasures is how it sits so snugly in its desert surroundings. Taken with the architecture of Rick Joy, McAdam thought about concrete, but he quickly learned that it wouldn’t meet his budget. He then considered a rustic steel structure reminiscent of the mining cabins he had explored over the years in the Mojave Desert. But again, cost was an issue. Then he visited a friend who was building equestrian facilities on her property. McAdam marveled at how the modular steel elements came together elegantly and quickly to form the barns, shelters, and other structures. After speaking with Barret Hilzer, one of the heads of FCP, Inc., the company that did the work on his friend’s property, McAdam became convinced he could use a similar steel framing system to build an affordable, sustainable, beautiful, and prefabricated home. In technical terms, the steel framing system that bewitched McAdam is a mezzanine system, with a point-loaded, bidirectional, moment-resisting frame made of cold-formed, light-gauge galvanized steel manufactured by ASC Profiles in Sacramento, California. It’s strong in two directions, resists twisting or bending, and won’t rust. It also happens to be cheaper than the structural steel systems normally used in residential construction. Each steel element is made in a factory and delivered to the building site, where it goes up like an erector set, requiring zero welding, little assembly time, and reduced costs. Once he saw the framing system’s potential, McAdam expanded his dream house in the desert into a dream of a marketable steel homebuilding system. After drawing up his own plans for a 1,000-square-foot weekend retreat using Hilzer’s system, he recruited residential builder Solterra Development, an architecture firm called o2 Architecture, and Hilzer. He also contacted Robert Brada, an old colleague and fellow architecture enthusiast, and they formed the company Blue Sky Homes. Their mission was to make McAdam’s home, and the homebuilding system he had stumbled on, into a reality. They succeeded. Every room in the house has a door to the outside. “Given the mostly temperate climate, you tend to have all of the doors pushed wide open all the time, and you find yourself outside as often as not,” explains McAdam. Unlike a wood-frame house, where load-bearing walls need to go in certain places to support the structure, a Blue Sky steel frame house doesn’t require interior walls. The architects at o2 capitalized on the flexibility the steel afforded them by emphasizing open space and a connection with the surrounding nature. Half of the house is one large public room containing the kitchen, dining, and living area. It extends to the outside through sliding glass doors that open up onto a 340-square-foot cantilevered deck out front. “When you’re in the main room, your eye is drawn inexorably to the dramatic weathered rock formations that rise steeply just beyond the house,” McAdam notes. A bamboo wall divides the interior. To maximize space, it doubles as a two-way storage unit, with cabinets for the kitchen and closets for the bedrooms. The cabinet boxes are Forest Stewardship Council–certified, and aside from the interior doors, they’re the only wood in the house. Behind the wall, two equal-size bedrooms sit on either side of the building’s factory-built core: the bathroom, water heater, air handler, and washer and dryer. One is hard-pressed to decide in which bedroom to sleep: The east bedroom looks out to rocks, and the west opens onto the desert floor. To achieve McAdam’s steel-home dream, though, the Blue Sky team had to overcome a significant problem: the thermal properties of steel. It can burn wicked hot in the desert sun before turning searingly cold on a frosty desert night. The conductive properties of steel tend to amplify whatever’s happening outdoors inside the house. After months of research, the team found a solution in the form of steel studs insulated with expanded polystyrene foam. A Pennsylvania firm, Accelerated Building Technologies, created a channel system through the foam that forces hot and cold temperatures to follow a zigzag path along metal pieces embedded in the insulation, thus deadening its effect on the interior temperatures. With the conduction problem solved, the builders were left to enjoy all the positive assets steel has to offer: Every piece is perfect, the frame goes up straight without any fuss, it’s mold resistant and fireproof, and it can be made with up to 70 percent reused materials and is completely recyclable itself. In fact, should you take it apart, you could put most of the Blue Sky home back in the recycling bin. Steel frame aside, the countertops in the kitchen and bathroom are Vetrazzo, a material made from recycled glass. A graywater system feeds the desert flora in the yard. Sunshine is recycled through the hydronic heating system that provides the home’s hot water and space heating, making this desert flower an off-the-grid marvel. But the key sustainable attribute is the building system itself, which boasts all of the environmentally friendly advantages of prefabricated construction. Like traditional prefabs, Blue Sky homes generate less construction waste than stick-built homes. Since everything is made to order in a factory and then shipped to the site, everything is used and nothing is left over. But unlike most prefabs, which require heavy site preparation that can be environmentally damaging, the Blue Sky frame adjusts to the site’s topography, and no harsh grading of the land is necessary. Scraping a housing pad is environmentally disruptive wherever it happens, but in some areas, like the near-pristine desert, it becomes a limiting factor. Environmentally inclined developers have approached Blue Sky about using its system to design low-impact resorts in locations with fragile ecosystems. And here, it’s hard to resist that environment—the almost alien boulderscape that beckons from every vista in the house. 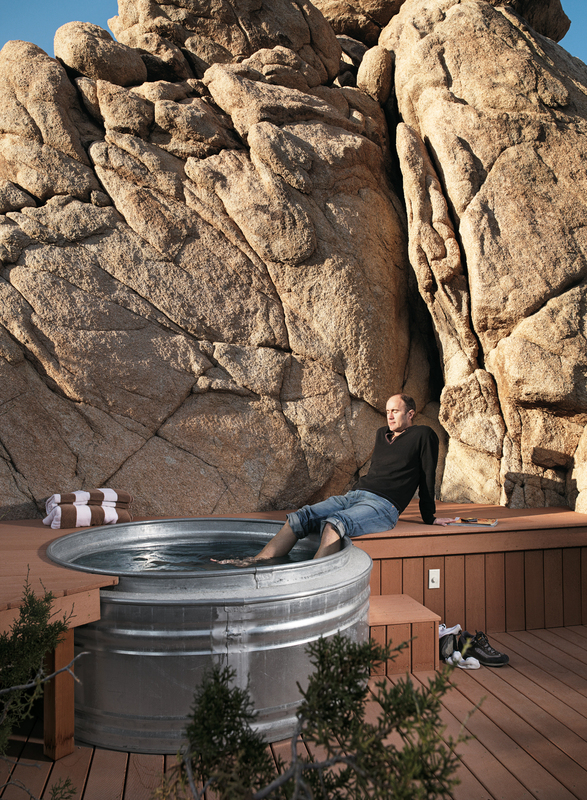 When McAdam and his partner, Scott Smith, are entertaining friends, they like to go on starlit hikes—rambles that often end around the fire pit or in the cowboy hot tub made from steel (what else?) troughs and filled with water warmed by the sun. But when the revelry ceases, the utter quiet and profound darkness of the Mojave Desert takes hold, and McAdam closes his eyes and resumes dreaming.